Below is the introduction – straight from the book – for The Late Round Quarterback: 2013 Edition. You can purchase the e-book here. It came back to haunt me. Every season I pour a lot of my time and energy into a hyper-competitive 14-team league that’s been around for a decade, made up of my best friends from high school and a few guys we’ve picked up along the way to replace the dropouts. And as much as I’d like to lie to all you wonderful people, last year, I didn’t win my fantasy football championship. I didn’t win the big cash prize or lock down exclusive bragging rights through August. My buddies across the country laughed, because I, a fantasy football writer, was beat out by my inept pal, Ankit. He’s been in the league for ten years, and up till now, he’d never even sniffed the playoffs. In fact, we suspended him one year because he neglected to check his team during a few bye-heavy weeks. He’s that guy to our fantasy league. You know who I’m talking about: the same guy who shows up to the draft late, pretends he has this awesome sleeper list consisting of players we’ve never heard of, and then shows his bluff when he selects Adam Vinatieri in Round 7. But this past summer, after the release of The Late Round Quarterback, he decided to pony up 500 American pennies to Amazon and bought my book for his Kindle. The result? He won. He won the championship. It was probably just a move to support his childhood friend, but Ankit’s five-dollar investment had turned into a much more lucrative one by season’s end. I’ll be honest, I didn’t expect it. I thought the Wharton grad would’ve pushed my ideas aside and drafted his fantasy team based on his favorite approach: nothing. Instead, he used the late-round quarterback approach. He understood and executed it brilliantly. His quarterbacks, Joe Flacco and Jay Cutler, meant little to his team throughout the season, but he knew it didn’t matter. He drafted his team for value. Defined as relative worth, value helps us determine which positions are most important in fantasy football. And when you figure out which positions mean the most in this fake sport of ours, you’ll be able to completely maximize your team’s potential. Now, I’ll be the first to admit that this book isn’t rocket science. If it was, I probably wouldn’t be writing about fantasy football. Really, the literature here is just some logical, common sense words and charts mashed with some football knowledge. I don’t have a degree in statistics, and I never played in the NFL (although I do throw a mean spiral at my annual Turkey Bowl). I’m just like you, only I’m obsessed with fantasy football. Or maybe you’re obsessed with fantasy football, too, in which case I advise you to seek medical attention immediately. 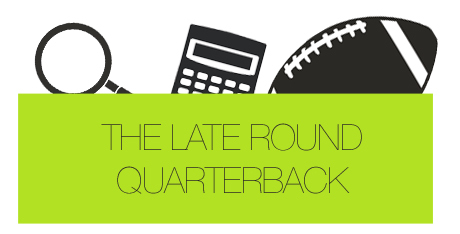 If you’re new to the late-round quarterback strategy, I hope I can win you over. And if you read the book last year, I’m confident that the new concepts and ideas I’ve added will help you develop your strategy even further. While my basic strategy remains the same, I’ve totally revisited and revamped certain sections of last year’s book, and I’ve included some new nuggets of wisdom. So don’t feel like you’ve bought a redundant piece of work. I would never do that to you. For you newbies, this book isn’t meant to be a draft kit. That information can be found at LateRoundQB.com. Rather, what I’ve written is supposed to make you think a little harder about things you’ve taken for granted for years. It’s here to make you question your existing fantasy football strategies, and to show you that the tactic that’s dominated mainstream strategy over the past few years – obtaining the top quarterback talent at the beginning of your fantasy draft – is wrong. There’s a logical and mathematical way of looking at fantasy football. But I entreat you: before you start reading, set aside everything you think you know about fantasy football, and home in on some of the concepts in this book. It will change the way you draft forever.